This weekend brought the most exciting post I have had in a long while, and for a change it was something destined for me rather than the Eskimini. 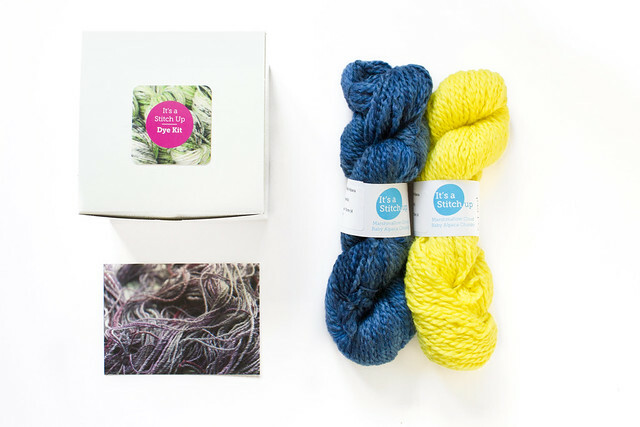 Inside the perfectly presented package were two skeins of Marshmallow Cloud yarn (a chunky weight baby alpaca yarn), soft and buttery to handle, and a Dye Kit. I’d been looking forward to this parcel from It’s A Stitch Up for only a couple of days, and I hadn’t even yet started to dream up what was in store for the yarn, so I decided to start the creative ball rolling by playing with the Dye Kit. Sold alongside It’s A Stitch Up’s beautiful hand-dyed offerings, the recent expansion of this UK-based venture sees these dye kits which allow even a first-time dyer to create their very own unique yarn in a number of colour ways in their own kitchen, and using the same ethically-sourced yarn milled in the UK as is available beautifully dyed and ready to knit in the store. The dye kits are available in a couple of different bases, and as I unpacked the little box of goodies I found inside a lovely high-twist superwash merino. Also included in the box were all of the bits and pieces needed to give speckle-dyeing a first go. Everything is thought of, from a miniature sieve (which immediately bought back pre-teabag era memories of my grandparents’ teapot and strainer) to high-quality protective gloves, plus all the materials needed to both create your own masterpiece of yarn dyeing and fix it firmly in place. 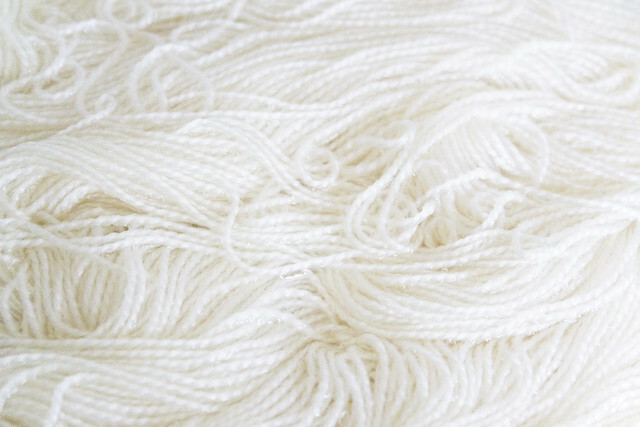 A close-up picture of the soaking yarn pre-dye shows the lovely smooth and high-twist texture which gives the yarn it’s bounce and strength. Following the included instructions to prep the yarn for dyeing was really simple; however, deciding on how to dye the skein was most definitely not! 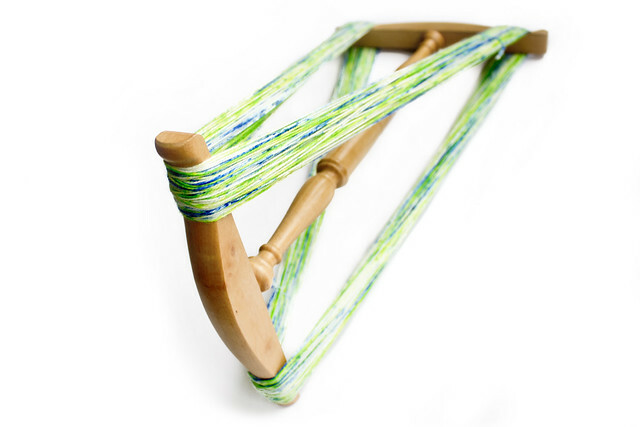 The kit contains two shades of dye, and there are many possibilities on how to use these to create something truly unique. As well as the option to use one or both of the dyes, the dyer can decide on whether to combine the colours or to keep them separate, and whether to go for a dense cover of dye or a more sparsely speckled effect. Enough dye is included to give a good full coverage, but I decided to try to maintain some white areas in my skein. 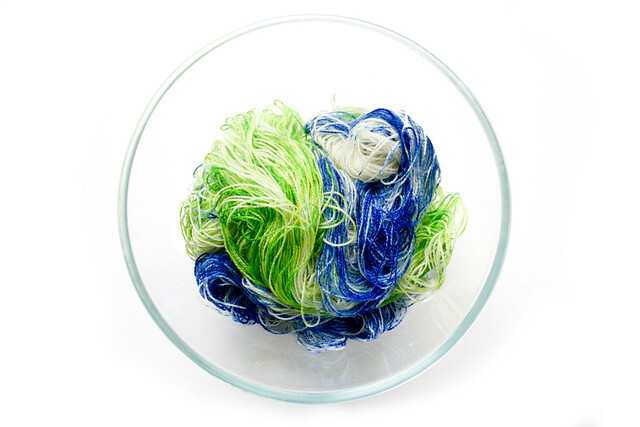 Once the dye had been applied this gave three areas of green speckled yarn, three blue, and with a couple of areas with little or no dye. Following the provided instructions I then set the dye using the microwave method, and then waited for the yarn to cool. 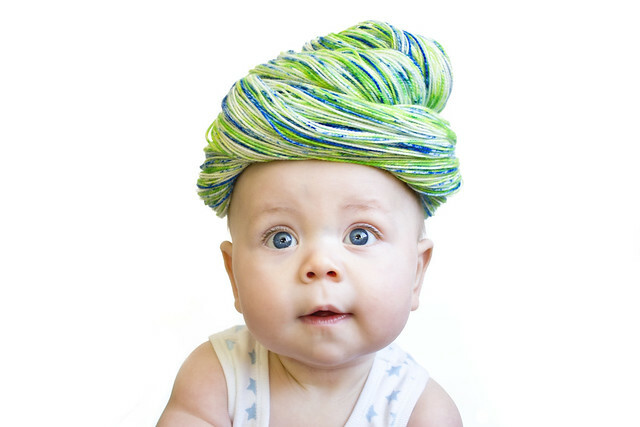 Eventually the yarn was cool to handle and I had chance to wash and inspect my creation. Bundled up like this it looks just like a mass of random colour, and to a certain extent that is exactly what it is. Professional indie dyers spend many hundreds and thousands of hours perfecting their craft to provide their customers with fine artisan products, and this was a speckle-dyeing first attempt, but when I rinsed and hung the skein up to dry I was very excited with the results, and once the skein was fully dry, the re-skeining brought out something I think is really quite lovely. 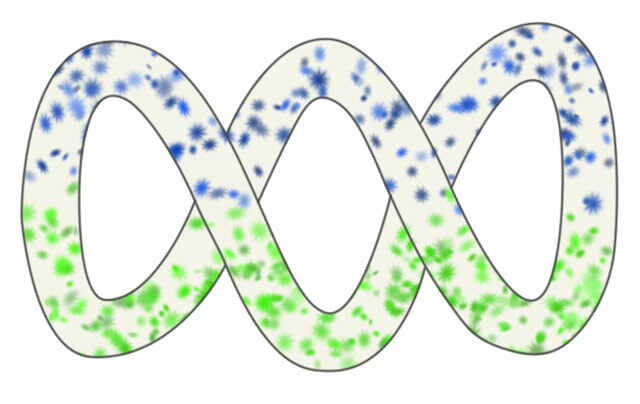 The areas of colour are not too overwhelming, yet there is still a good balance and coverage of pigment. Once re-skeined, the colours reminded me of distant photos of the earth, the greens of the land, blues of the oceans and white of the clouds. 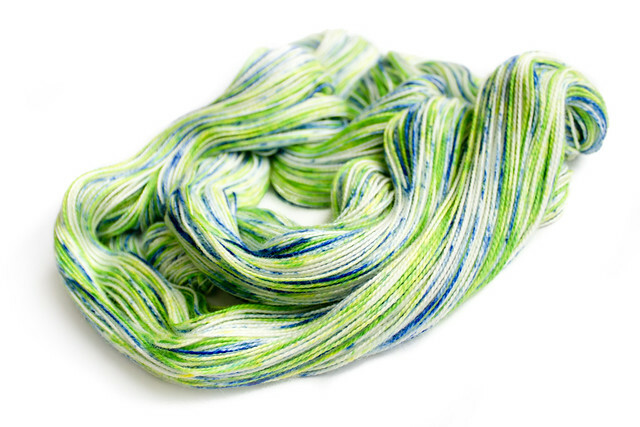 The speckle dyeing technique allows the dye pigments to spread as you agitate the yarn slightly, leading to variations in the saturation of the dye and strength of colour, and this added further to the depth and variety of the finished skein. I am extremely pleased with this skein of yarn, and I am very much looking forward to seeing how it might knit up: I think I shall have to do some experimental swatching before settling on what it shall become. However, plans for my own hand-dyed skein shall have to wait a while, as before then I have two beautiful skeins of the Marshmallow Cloud yarn to fondle, enjoy and dream up a project or two for; and that is most definitely what I shall enjoy my next few days doing. 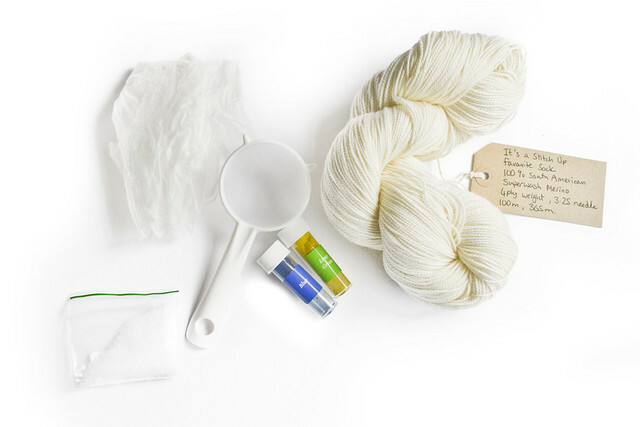 Speckle Dyeing kits and It’s A Stitch Up’s ethically sourced and beautiful dyed yarns are available to buy from the online store, and are shipped worldwide for a low flat rate. Whilst visiting the store, do take a moment to read the ethos and philosophy of this wonderful venture for an insight into why ethically sourced yarn and the craftsmanship of our indie dyers should be of utmost important to us as knitters and craftspersons so that we can all better enjoy the things that we create. I will be back soon with tales of what the two soft bundles of yarn at the top of the post might become, as long as I can tear myself away from enjoying my own speckly creation. Disclaimer: I received the above dye kit and yarn free with no obligation to review and I would not endorse a product that I did not think was of excellent quality and value. The above views are entirely my own and have not been suggested or prompted by the vendor. Baby is blogger’s own. That’s really pretty! 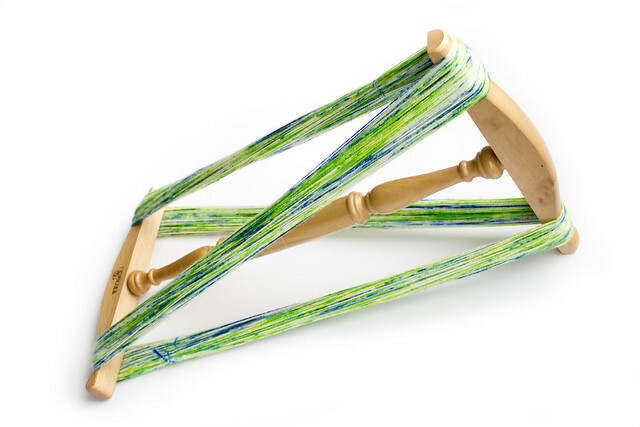 I didn’t even know that you could dye yarn without a big studio. I totally want to give this a go and and going look now yay! My kitchen is smaller than most people’s cars. You definitely don’t need a big studio. That would not look out of place amoung professionally dyed yarns. I’ve always wanted to give this a go but was worried about the actual cost of materials as it would only be for the odd hank or two. Would I need much more than in the kit could you tell me? It is so pretty and your last photo is adorable! That is so pretty ! Love it ! 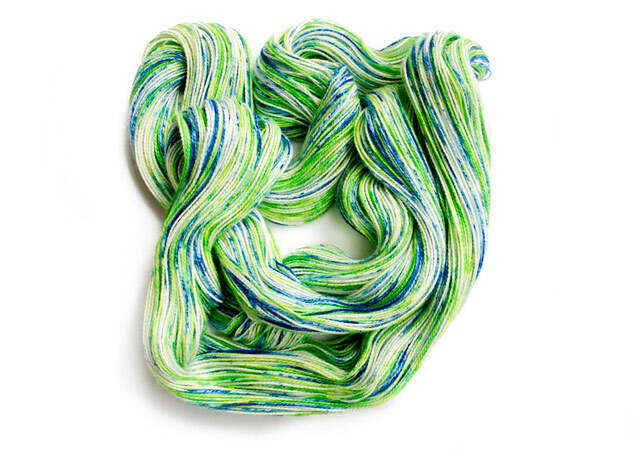 I never had much interest for dyeing yarn, but now, I’m tempted ! Dear Eskimimi. 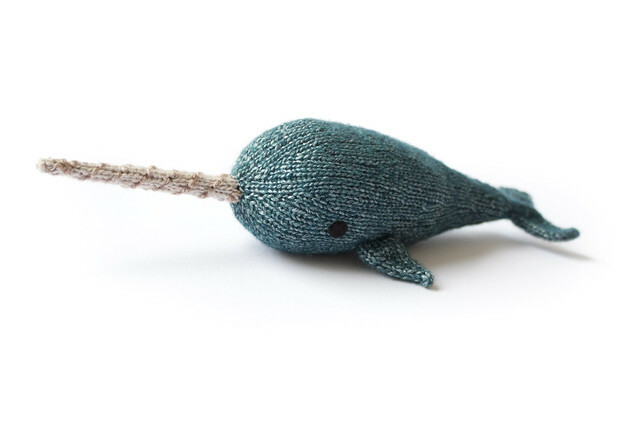 i hadnt looked at your lovely blog for ages … months in fact… and today I just thought about you and lo and behold what do I see on the page but a little mini you ! congratulations and what a beautifully awesome baby !! !